What happens on a Meetup? What happens on a Christian Connection Meetup? Jackie ventures out of the London office to find out. Would I get there on time? Would I be safe once in the depths of the Dales? If I wasn’t having fun, how could I escape? Would the snow have melted, and if not would it be taller than me? The walk was organised by Ruth and Nick, who have been running CC Meetups from way back when they started advertising on the Out and About Board and then through the Meetups area. It was easy to see why they are popular. I was given a friendly welcome and introduced to the group and we were soon walking at a good but not too demanding pace and witnessing glorious British countryside which was even occasionally sunny. 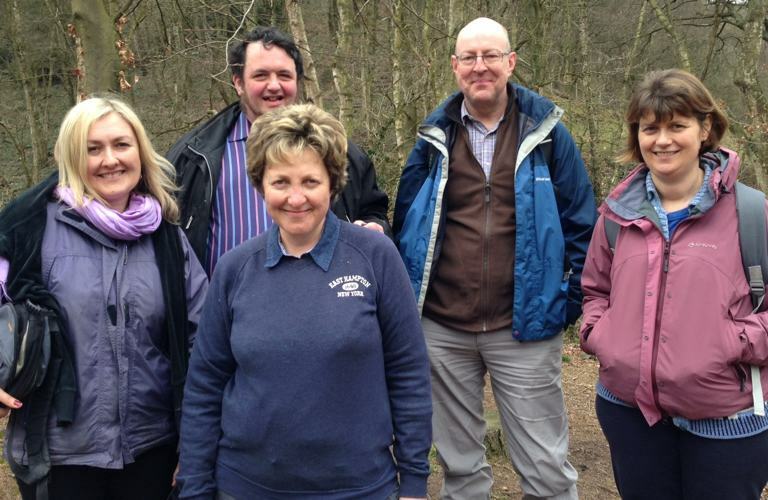 Walks are a wonderful way of getting to know people individually, whilst getting some bracing exercise. Some people might have been a little wary of what I might be up to – was I checking up? But that soon passed. Not checking up, just checking in! Nick had meticulously planned the walk, walked it ahead of time and adjusted the route to fit the conditions. It worked well. It was also good that he and Ruth led the Meetup together and other members also pitched in to organise future events as well. It was clear that people have built strong lasting friendships, but were also inclusive of newcomers. They were also very supportive of our work on CC. At the end of the walk, we sat down for drinks in a lovely local pub and the group discussed the next planned event with enthusiasm and organisation. At CC we spend our time with customer service, marketing and development and office duties. It’s easy to forget life outside the office! Well here things were different. A committed volunteer group of people, having fun, meeting with and supporting each other. Grateful for the facility CC provided but prepared to pitch in with all the planning and hard work. Encouraging other Meetup groups with what they did as well. Not waiting for CC or churches to do something – just getting on with it. As I drove back – I was so pleased I went, and rather keen for another Meetup. Research quoted in CC’s recent talk on Online dating emphasised how online dating works best for those who meet together, get together and really communicate. “One thing is for certain, you will not meet the right person, if you don’t meet anybody”. Meetups are one great way of getting out and meeting people and developing friendships and relationships. If you have any good stories of Meetups do share them and if you haven’t yet taken the plunge – give them a go! There are plenty to choose from.